Bob, Sue and Rob Kemp welcome you. The Kemp family is from Suffield, spent a few years in Enfield, then returned to make their permanent home in Suffield. 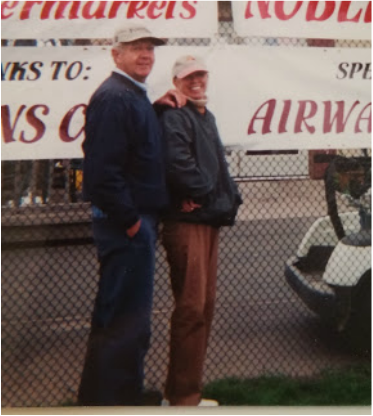 After Bob’s career in banking, Bob and Sue purchased the Airways Golf Course in 1996 with the intent to make a living while still providing good, affordable and friendly golf to the town and surrounding communities. Rob worked on course maintenance before transitioning into working behind the golf counter. Looking for a great way to say "thank you" to your employees, customers, and business associates who help keep your business growing and financially sound? Looking for a way to build morale, attract prospective clients in a non-business setting sure to leave everyone feeling better about your company? Airways Golf is pleased to announce that we can arrange 9 or 18 hole golf packages designed to fit your specific desires and every level of golfer. Packages can include electric carts and play can be held any weekday, weekend or holiday. Food and beverage is also available for your event at a price you will find hard to match. Golf tournaments can be one of the easiest ways in which to raise funds for nonprofit organizations or special purposes. One tournament raised more than $9,000 in one day here at Airways. League play at Airways is encouraged. If you are interested in bringing a league to Airways for weekday or weekend play contact the manager at (860) 668- 4973. Airways regular golf season runs from April 1st to November 30th. As a matter of policy, Airways remains open all year for golfers who just can't get enough. Off season rates for members and associate members are $5.00 for 9 holes, and $10.00 for eighteen holes. Electric cart rental is also available.